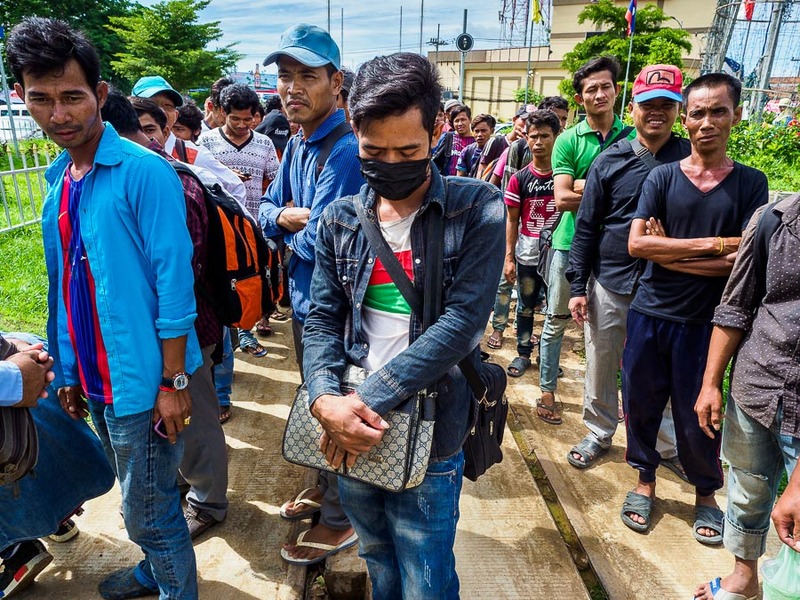 Cambodian migrant workers line up in Poipet, Cambodia, before walking across the border to accept jobs in Thailand. 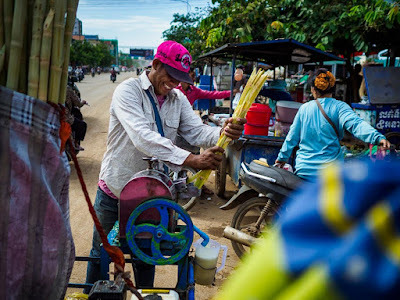 I went back to Poipet, Cambodia, this week to photograph migrant workers. Thailand has the largest economy in mainland Southeast Asia. An insatiable demand for low wage workers fuels a part of that economy. As the Thai middle class expanded, Thai labor became more expensive (compared to labor in neighboring countries) at the same time wages in Thailand increased much faster in Thailand than wages in neighboring countries, so increasing numbers of migrant workers came to Thailand to earn a living. 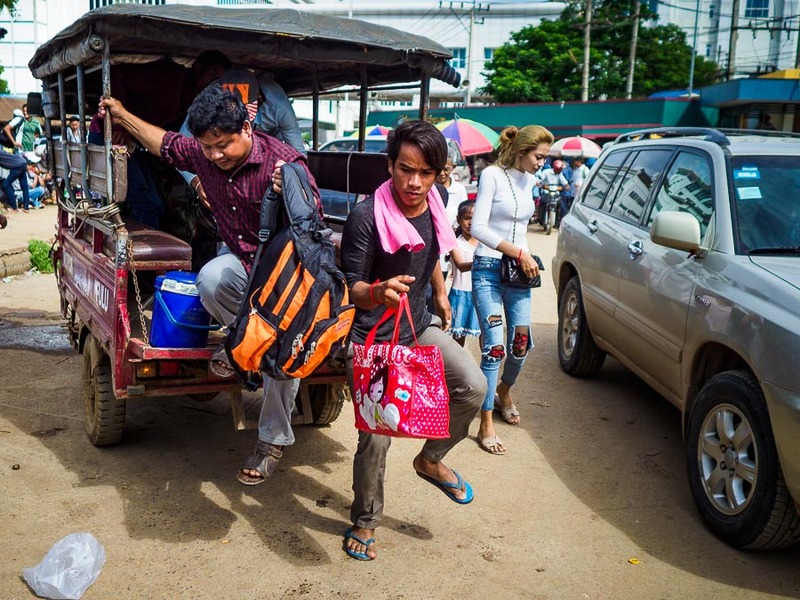 Aspiring migrant workers in Poipet arrive at the border with their backpacks. Most of the men arriving at this border crossing have their documents in order and will be taking legal jobs in Thailand. The situation is not unlike what's happened in the US attracting migrant workers from Latin America or the UK, which has attracted migrant workers from Eastern Europe. The workers come, drawn by higher wages available in Thailand (or the US or the UK) and employers hire them because they can pay them a fraction of what they would pay native born workers. This has been an issue in Thailand for as long as I've been coming here. In 2009, I photographed women working in a garment factory in northern Thailand. The factory owner told me he only hired Burmese because they didn't demand all the perks Thais did and they worked for less money. It's exactly what US employers in Arizona said about Latin American immigrants they hired. 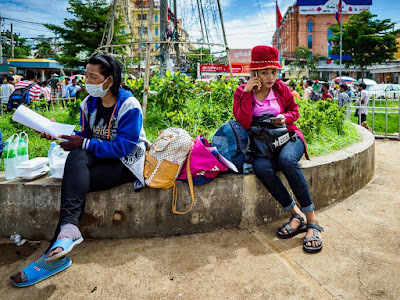 Cambodian migrants just returned to Cambodia from Thailand cross a busy street in Poipet. From time to time, Thailand tries to regulate the migrant workers. 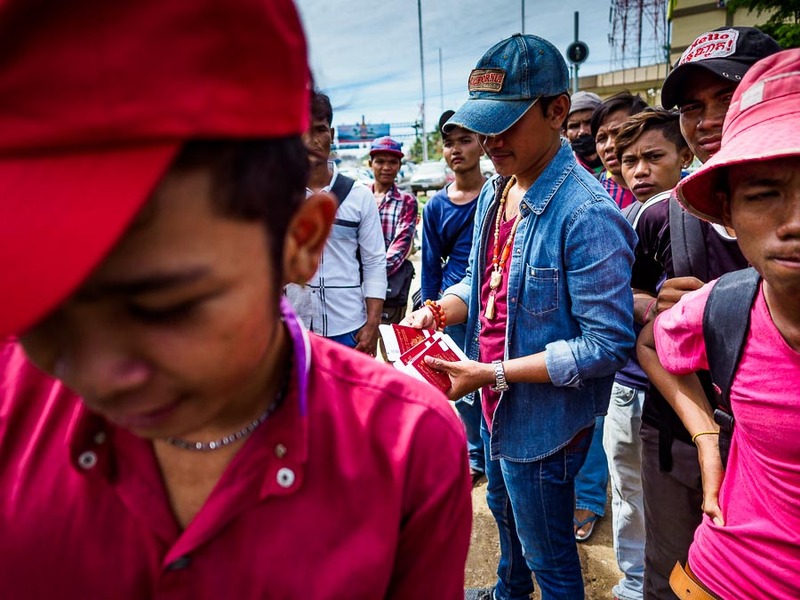 In 2014, hundreds of thousands of Cambodians fled Thailand, fearing a military crackdown and ethnic violence directed against them. I covered the 2014 exodus and it was one of the strangest things I've ever photographed here. I went out to Poipet, about three hours from Bangkok, to photograph Cambodians returning home. Poipet is a dusty frontier town. Not unlike Aqua Prieta, Mexico. I was expecting to see crowds of people in the center of town making travel arrangements to return to their home towns. A sugar cane juice vendor in Poipet crushes cane for customers just returned from Thailand. There were a few people coming back to Thailand, crossing the border with everything they owned stuffed into plastic bags. But there many more people in the center of town waiting to be taken into Thailand. 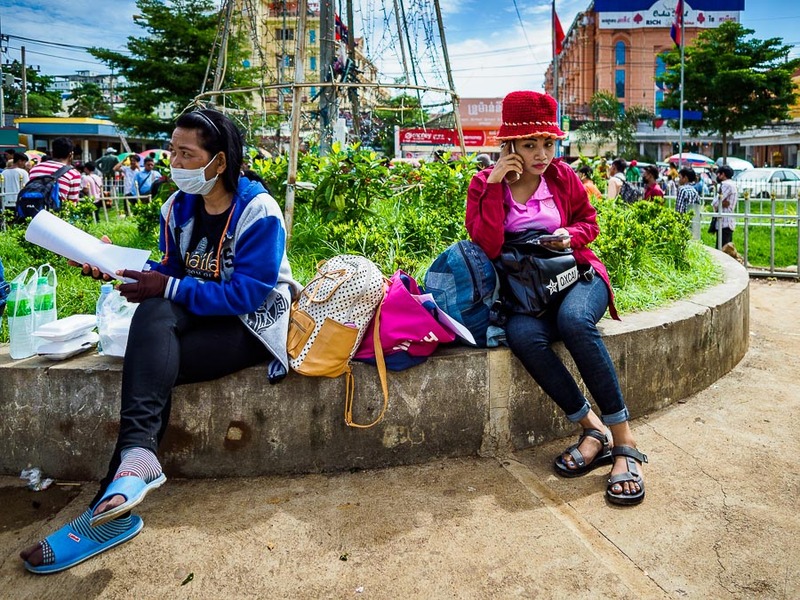 Women returned from Thailand wait for transportation in the center of Poipet. A man who works for a labor broker (center, blue hat) returns passports and documents to men he is taking to Thailand. He made sure all of their documents were in order so they could work legally in Thailand. The migrants in Poipet were prepared for their journey to Thailand. They had passports and the brokers were checking documents to make sure they could work legally in Thailand. It was very systemized. 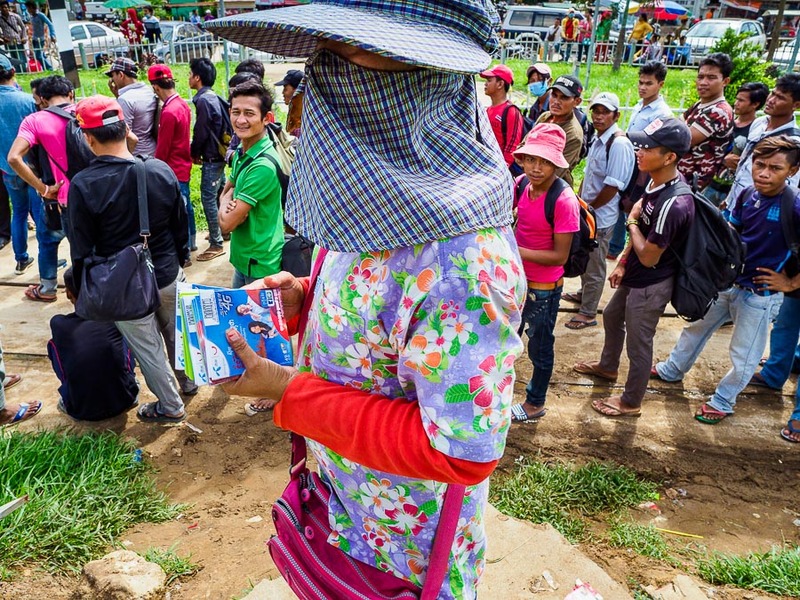 A Cambodian woman sells Thai SIM cards to Cambodian migrants waiting to cross the border into Thailand. Americans tend to think immigration problems are a uniquely American issue. Americans would be wrong in thinking that. It's a global problem. Employers are focused on maximizing profit with no regard for societal costs.